What is the best undergrad major for occupational therapy school? I majored in athletic training, which has been surprisingly useful in my professional life. In addition to dealing with injuries and pain, it taught both hands on and clinical reasoning skills. But, I didn't always know I wanted to be an occupational therapist. Thankfully, I was able to finish and graduate undergrad with a major I loved while still pursuing admissions to OT school. Is there a "best" undergrad major for occupational therapy? If you know that OT is the career for you, there are several majors you can choose before applying. As mentioned before, these majors will give you an opportunity to practice your personal and clinical skills before entering occupational therapy school. When you are working with athletes, you begin to understand the psychology of an individual after they experience a minor (or major) injury. Often this alters one's trajectory in school or academics affecting their mood and mental health. Being able to communicate and empathize with others during their lowest moments will provide you with valuable skills in OT school and your future career. Exercise science is also a great major for occupational therapy school. While studying basic anatomy and exercises to help clients reach their goals (which is very OT), you are learning skills in biofeedback, communication, and grading activities. Grading activities is something you will learn much more about once you are in OT school. Essentially, it looks like this. If you prescribed an activity and it is too easy, the client will never reach their goal. If it is too hard, they won't have the chance to progress. You are looking for the "just right challenge". You learn this as an exercise science major with basic physical activity and it's a skill applicable to all occupational therapy settings. Some may argue that biology (or chemistry or physics) is the best undergrad major for occupational therapy. These science courses will be some of the most challenging in your college career and will prepare you for the academic rigors of OT school such as anatomy and neuroscience. You won't learn the hands on skills as the previously mentioned majors. However, you will have a leg up in research courses and statistics by thoroughly understanding the scientific method. It might not make sense now, but this is crucial for the future of occupational therapy. We all need to understand the research and evidence based practice for the good of our clients and advocacy of our profession. Psychology is a sneaky useful undergrad major for occupational therapy school. Human development and education are also majors great for OT or are minors to help facilitate future OT skills. Let me explain. Occupational therapy and mental health go way back to the beginning of OT. In current times, it is a major focus area in OT education, but very few OTs work in traditional mental health settings. So, while this may be true, psychology is an important major for all of us. Every client no matter what age will have life issues either hindering or facilitating their rehab goals. Understanding this is crucial to the progress of your future clients. Psychology majors also learn a lot about human development and education. This gives you a leg up in your pediatric and aging classes because you will already understand the pediatric milestones and how humans develop emotionally and socially as we age. And by sprinkling in some education in there, you will now understand teaching and methods of learning (something that we OTs do every day). No matter what your passion is, there is always a way to make it relevant to occupational therapy. Use this as your chance to pursue business or performing arts. Not only will this provide you with skills as a therapist, it makes you unique and your application stick out. It is a rare thing to take electives in grad school, so use this as an opportunity to try new things. I managed to squeeze all my prerequisites in my four-year college career, but I am also thankful for my electives. Taking a theater makeup class and African American literature really opened my eyes. Not only were these courses fun, but they gave me a more well-rounded education. 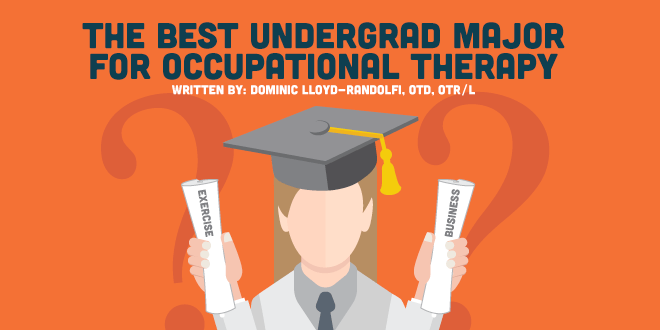 There is no absolute answer for what is the best undergrad major for occupational therapy. You will get out what you put in. Overall, your major is only a very small part of your application. Your OT experience, extracurricular activities, and jobs will all play a role in determining your readiness for graduate school.